Y. Bar-Yam, Complexity Rising: From Human Beings to Human Civilization, a Complexity Profile, in Encyclopedia of Life Support Systems (EOLSS), developed under the Auspices of the UNESCO, EOLSS Publishers, Oxford, UK, 2002. What is generally not recognized is that the relationship between collective global behavior and the internal structure of human civilization can be characterized through mathematical concepts that apply to all complex systems. An analysis based upon these mathematical concepts suggests that human civilization itself is an organism capable of behaviors that are of greater complexity than those of an individual human being. In order to understand the significance of this statement, one must recognize that collective behaviors are typically simpler than the behavior of components. Only when the components are connected in networks of specialized function can complex collective behaviors arise. The history of civilization can be characterized through the progressive (though non-monotonic) appearance of collective behaviors of larger groups of human beings of greater complexity. However, the transition to a collective behavior of complexity greater than an individual human being has become apparent from events occurring during the most recent decades. Human civilization continues to face internal and environmental challenges. In this context it is important to recognize that the complexity of a system's behavior is fundamentally related to the complexity of challenges that it can effectively overcome. Historic changes in the structure of human organizations are self-consistently related to an increasing complexity of their social and economic contexts. Further, the collective complexity of human civilization is directly relevant to its ability to effectively respond to large scale environmental challenges. Building a model of society based upon physical forces between atoms, or cellular physical and chemical interactions, would be quite difficult. Even constructing a model based upon social interactions is too difficult. To consider the collective behavior of human civilization, one must develop concepts that describe the relationship of individual to collective behavior in a more general way. The goal of this article is to extend the systematic understanding of collective or cooperative behavior so as to characterize such behavior in physical, biological and social systems. All macroscopic systems, whether their behavior is simple or complex, are formed out of a large number of parts. The following examples suggest insights into how and in what way simple or complex behaviors arise. Inanimate objects generally do not have complex behaviors. Notable exceptions include water flowing in a stream or boiling in a pot, and the atmospheric dynamics of weather. However, if water or air are not subject to external force or heat variations, their behavior is simple. Nevertheless, by looking very closely, it is possible to see the rapid and random thermal motion of atoms. Describing the motion of all of the atoms in a cubic centimeter of water would require a volume of writing which is more than ten billion times the number of books in the Library of Congress. Though this would be a remarkably large amount of information, it is all irrelevant to the macroscopic behavior of a cup of water. Thermodynamics and statistical mechanics explained this paradox at the end of the 19th century. The generally independent and random motion of atoms means that small regions of equal size contain essentially the same number of atoms. At any time the number of atoms leaving a region and the number of atoms entering it are also essentially the same. Thus, the water is uniform and unchanging. While biological organisms generally behave in a more complex way than inanimate objects, independent and randomly moving biological microorganisms also have simple collective behavior. Consider the behavior of microorganisms that cause diseases. What is the difference between the microorganisms and the cells that form a human being? From a macroscopic perspective, the primary difference is that a large collection of microorganisms do not result in complex collective behavior. Each of the microorganisms follows an essentially independent course. The independence of their microscopic actions results in an average behavior on a large scale which is simple. This is true even though, like the human being, all of the microorganisms may originate from a single cell. There is a way in which the microorganisms do act in a coherent way: they damage or consume the cells of the body they are in. This coherent action is what enables them to have an impact on a large scale. It is only because many of them perform this action together that makes them relevant to human health. The notion of coherence also applies to physical systems. Atoms at room temperature in a gas, liquid or solid, move randomly at speeds of 1000 km/hr but have less large scale impact than an object thrown at much slower speed of 50 km/hr. It is the collective coherent motion of all of the atoms in the object that enables them to have impact on a large scale. Thus, there are two paradigms for simple collective behavior. When the parts of a system have behaviors that are independent of each other, the collective behavior of the system is simple. Close observation reveals complex behavior of the parts, but this behavior is irrelevant to the collective behavior. On the other hand if all parts act in exactly the same way, then their collective behavior is simple even though it is visible on a very large scale. These examples of behavior can also be seen in the historical progression of human civilization. Primitive tribal or agrarian cultures involved largely independent individuals or small groups. Military systems involved large coherent motions of many individuals performing similar and relatively simple actions. These coherent actions enabled impact at a scale much larger than the size of the military force itself. By contrast, civilization today involves diverse and specialized individual behaviors that are nevertheless coordinated. This specialization and coordination allow for highly complex collective behaviors capable of influencing the environment on many scales. Thus the collective behavior of human civilization arises from the coordinated behavior of many individuals in various groupings. It is much easier to think about the problem of understanding collective behavior using the concept of a complexity profile. The complexity profile focuses attention on the scale at which a certain behavior of a system is visible to an observer, or the extent of the impact it can have on its environment. Both of these are relevant to interactions of a system with its environment: an observer can see the behavior only when the behavior is sufficiently large to affect the observer. A formal definition of scale considers the spatial extent, time duration, momentum and energy of a behavior. More intuitively, when many parts of a system act together to make a single behavior happen, that behavior is on a large scale, and when few parts of a system act together, that behavior is on a small scale. The energy of different actions of the system is also relevant. When the amount of energy devoted to an action is large, then it is a large scale action. In essence, the units of energy are working together to make a large scale behavior. A more systematic treatment of the scale of particular behaviors leads to the complexity profile. The complexity profile counts the number of independent behaviors that are visible at a particular scale and includes all of the behaviors that have impact at larger scales. The use of the term "complexity" reflects a quantitative theory of the degree of difficulty of describing a system's behavior. In its most basic form, this theory simply counts the number of independent behaviors as a measure of the complexity of a system. The complexity profile characterizes the system behavior by describing the complexity as a function of scale. The central point is: When the independence of the components is reduced, scale of behavior is increased. To make a large collective behavior, the individual parts that make up this behavior must be correlated and not independent. This reduction of independence means that describing the collective behavior includes part or all of the behavior of the parts and therefore our description of the parts is simpler. When the behaviors of parts are coupled in subgroups, their behavior is manifest at the scale corresponding to the size of the group. Thus, fixing the material composition and the energy of the system, there are various ways the system can be organized. Each way of organizing the system and distributing the energy through the system results in tradeoffs between the complexity of their microscopic description against the complexity of their description at progressively larger scales. To illustrate the complexity profile, consider a system in which the parts behave independently. The system behavior at a small scale requires specifying what each of the parts is doing. However, when observing on a larger scale, it is not possible to distinguish the individual parts even in a small region of the system, only the aggregate effect of their behavior is observable. Since their behaviors are independent, they cancel each other in their impact on the environment. Thus, the description of the system behavior is simple. The behavior of each individual part disappears upon averaging the behavior of the local group. Examples of this include microorganisms swimming randomly in a pond or people moving around in a crowd that does not move as a whole. When one person goes one way, another person fills his place and together there is no collective movement. Independent behavior is to be contrasted with coherent motion. In coherent motion all of the parts of the system move in the same direction. This is the largest scale behavior possible for the system. Since the behaviors of the parts of the system are all the same, they are simple to describe on the largest scale. Moreover, once the largest scale behavior is described, the behavior of each of the parts is also known. Neither of these two examples corresponds to complex collective behavior. Unlike the coherent motion case, complex behavior must include many different behaviors. Unlike the independent action case, many of these behaviors are visible on a large scale. In order for such visibility to occur various subgroups of the system must have coordinated behaviors. The resulting dynamic correlations are distributed at different scales. Some of them are found at a microscopic scale in the coupled motion or positions of molecules, and others appear in the collective motion of, for example, muscle cells and the motion of the body as a whole. Thus, the complexity profile of a complex system like a human being involves a distribution of scales at which behavior manifests itself. This balance between highly random and highly ordered motion is characteristic of the behavior of complex systems. The discussion of independent, coherent and complex behavior can be applied to physical, biological or social systems. Think about the gas molecules that bounce independently in a room, or the coherent alignment of magnetic regions of a magnet. In the former case, all of the parts of the system act independently and the complexity profile resembles the independent component example. In the latter, the parts of the system are all aligned, and there is a large scale behavior. In biological systems a collection of microorganisms may act essentially independently, and a disease microorganism by multiplying and acting coherently in attacking the human body can have impact on a much larger scale. Finally, the cells of the body are interdependent and have collective complex behavior. The application of these concepts to human organizations and social systems will take us further in our understanding of various ways collective and coherent behaviors can arise. In this context, one of the main mechanisms for achieving coordinated behavior is the exercise of control by one individual over the behavior of others. Thus, it is particularly interesting to consider how control affects the collective behavior of human beings. The discussion of the complexity profile did not address the mechanisms that cause correlations in the behavior of the parts. This section focuses on internal interactions that at any one time give rise to collective behaviors. In human organizations coordination occurs because individuals influence each others' behavior. The influence is often called control. It is not necessarily coercive control, though coercion may be an aspect of control. The objective of this section is to understand the relationship between control structure and the complexity of collective behavior. Real human hierarchical organizations are not strict hierarchies, they contain lateral interactions that enable control to bypass the hierarchy.  However, by focusing on an idealized control hierarchy it is possible to understand the nature of this structure. Such a focus will help in understanding the nature of dictatorships and hierarchical corporations, the relationship between these control structures and complex collective behavior. In an idealized hierarchy all communication, and thus coordination of activities, is performed through the hierarchy. To concretize the discussion, consider two paradigmatic examples: military force and factory production. Conventional military behavior is closer to our discussion of coherent behavior. Similar to coherent motion, in the military the behavior of an individual is simplified to a limited set of patterns. The behavior patterns, such as long marches, have a high degree of repetition and thus can have impact on a large scale. Then, many individuals perform the large-scale behaviors coherently. While this model continues to apply to some examples of modern military activity, the diversity of actions of a modern military makes this model better suited to understanding ancient armiesRoman legions, or even U. S. Civil War armies. While the actions of the military are designed to have impact on a large scale, they must still be performed in response to specific external conditions. As the conditions change, the actions must also be changed. There is need for a response mechanism that involves communications that can control the collective behaviors. Such a response generally involves direct action by the control hierarchy. A conventional industrial production line also simplifies the behavior of an individual. Each individual performs a particular repetitive task. The effect of many individuals performing repetitive tasks results in a large number of copies of a particular product. This repetition increases the scale of impact of an individual's behavior. However, unlike coherent behavior, the behavior of different individuals is not the same. Instead, the activities of the individual are coordinated to those of others; the coordination exists so that the larger-scale behavior can arise. The coordination means that the behaviors of different individuals, while not the same, are related to each other. When compared to the coherent motion, this increases the complexity and decreases the scale, but much less so than would be the case for fully independent individuals. The need to ensure coordination of different individuals when the collective actions being performed have an inherently higher complexity increases the demands upon the control hierarchy. In particular, it is significant that the behaviors of all parts of a production line must be coordinated, even though actions being performed are different. The similarities and differences between the factory and the military models are relevant to an understanding of the role of hierarchical control. A military force, a corporation, or a country have behaviors on various scales. At larger scales, many of the details of the behavior of individuals are not apparent. Intuitively, a control hierarchy is designed to enable a single individual (the controller) to control the collective behavior, but not directly the behavior of each individual. Indeed, the behavior of an individual need not be known to the controller. What is necessary is a mechanism for ensuring that control over the collective behavior be translated into controls that are exercised over each individual. This is the purpose of the control hierarchy. A hierarchy, however, imposes a limitation on the degree of complexity of collective behaviors of the system. This can be understood by considering more carefully the processes of coordination. The hierarchy is responsible for ensuring coordination of various parts of the system. Lower levels of the hierarchy are responsible for locally coordinating smaller parts of the system and higher levels of the hierarchy are responsible for coordinating the larger parts of the system. At each level of the hierarchy the actions to be coordinated must be transferred through the controller. Thus, the controller's behavior must itself reflect all of the impacts that different parts of the system have on other parts of the system. This implies that the collective actions of the system in which the parts of the system affect other parts of the system must be no more complex than the controller. In human hierarchies the collective behavior must be simple enough to be represented by a single human being. In summary, the complexity of the collective behavior must be smaller than the complexity of the controlling individual. A group of individuals whose collective behavior is controlled by a single individual cannot behave in a more complex way than the individual who is exercising the control. Hierarchical control structures are symptomatic of collective behavior that is no more complex than one individual. Comparing an individual human being with the hierarchy as an entirety, the hierarchy amplifies the scale of the behavior of an individual, but does not increase its complexity. The existence of lateral influences counters these conclusions with respect to real human organizations. These lateral controls are similar to the conceptual networks that are used to model the interactions between neurons in the brain. Distributed control over collective behaviors can result in larger complexity of the collective behavior than the behavior of any single individual. Networks are also quite distinct from independent individuals. Networks require that coordination of the behavior of groups of individuals are achieved by mutual influences. The discussion of the complexity of the behavior of a system at different scales does not explain, in itself, why systems should be simple or complex. According to thermodynamics, an isolated system will always increase its entropy. Since the entropy is a measure of disorder, it corresponds to microscopically random behavior and simple collective behavior. Fortunately for us, the world is not an isolated system. The high temperature of the sun causes it to illuminate us with light. The energy of this light is reemitted into space at a much lower effective temperature. This energy flow from high to low temperature, combined with physical properties of the earth, enables all of the complex patterns of weather and of biological and social life on earth. While it enables, the energy flow does not explain how complex systems arise. In terms of the individual physical, biological or social systems, the overall energy flow is translated into a selection of entities that "survive" sustaining themselves or similar offspring by obtaining resources that preserve their structure over time. In its most basic form, this concept (usually applied to biological organisms) applies to non-equilibrium physical, biological and social systems whose behavior is preserved by the flow of energy. There is still much to be understood about this process. The demands that environmental conditions place on the organism's pattern of behavior create the necessity of complex behavior. In order to survive, the organism behavior must reflect in some way the nature of the environment. Some behavior patterns will result in obtaining the needed resources while others will not. The environment is not a static system, and over time, the organism responds to the environment in a manner that is dictated by the organism's internal structure. The response of an organism at a particular scale is implicit in its behavior patterns at that scale. The complexity of an organism's response is given by the complexity of its behaviors. More directly, the number of independent behaviors is related to the number of independent environmental factors/conditions that the organism can effectively respond to. To quantify the demands that the environment places on an organism, consider the minimum complexity of a system which achieves a target objective (e.g. survival) with some specified probability of success. As the probability of success increases the minimum organism complexity increases. Note that for many types of biological organism, the typical number of organisms remains relatively constant over many generations. However, the number of offspring per parent varies widely from one to millions. This suggests that the probability of successful survival of an organism is a measure of the relative complexity of the environmental demands to the complexity of the organism. Organisms that are less complex than the demands of the environment have a lower probability of survival, even if well adapted. From this argument it is possible to begin to understand processes of historical change in human organizational structures. Human organizations exist within an environment that places demands upon them. If the complexity of these demands exceeds the complexity of an organization, the organization will be likely to fail. Thus, those organizations that survive must have a complexity sufficiently large to respond to the complexity of environmental demands at the scale of these demands. As a result, a form of evolutionary change occurs due to competition. Competition is relevant because for human organizations, the environment itself is formed in part out of organizations of human beings. According to this argument, one can expect a self-consistent process of complexity increase where competition between organizations causes the behavior of one organization to serve as part of the environment in which others must survive. In recent years human organizations that emphasized central control have changed or given way to other structures with greater distribution of control. This includes political organizations, the systematic conversion of dictatorships in Central and South America to more democratic systems, the fragmentation of the soviet bloc and replacement of government controlled economies in communist countries with market based economies, and the restructuring of hierarchical corporations in western economies to involve decision teams and process based managerial strategies. Many of these changes result in systems where collective behaviors arise from partially independent subgroups of the system and lateral "networked" influences. Even when control hierarchies continue to exist, the lateral interactions through group decision making processes have become more prominent. To understand this more fully, consider the history of civilization and the complexity of environmental demands upon each civilization and the individuals that comprise it. The progressive historical increase of complexity means that organizations that do not change do not survive. This is descriptive of the nature of the transition that is under way. The complexity of demands upon collective human systems have recently become larger than an individual human being. Once this is true, hierarchical mechanisms are no longer able to impose the necessary coordination of individual behaviors. Instead, interactions characteristic of networks are necessary. In a review of history, the development of hierarchies can be seen to enable progressively more complex behaviors. Two factors are important, progressively smaller branching ratios and lateral interactions. Both will be described below. There are also two complementary aspects to this development, complexity at the scale of the individual and complexity at the scale of the collective. In general, these complexities are not directly related. In the context of a control hierarchy, however, the complexity of individual behaviors increases with increasing complexity of collective behavior. The complexity/diversity of individual behaviors does not directly explain the difficulties experienced by hierarchies. The complexity of collective behaviors does explain the difficulties experienced by control hierarchies, since controlling these behaviors is the role of central control. From earliest recorded history until the fall of the Roman empire, empires replaced various smaller kingdoms that had developed during a process of consolidation of yet smaller associations of human beings. The degree of control exercised in these systems varied, but the progression toward larger more centrally controlled systems is apparent. As per our discussion of the difference between independent individuals and coherent behaviors, this process was driven by military force. Indeed, during the time of ancient empires, large-scale human systems executed relatively simple behaviors, and individuals performed relatively simple individual tasks that were repeated by many individuals over time to have a large-scale effect. This observation applies to soldier armies, as well as slaves working in agriculture, mines or construction. The scale of ancient empires controlled by large armies, as well as the scale of major projects of construction would be impressive if performed today. The scale of activity was possible, without modern sources of energy and technology, because of the large number of individuals involved. However, the nature of the activity was simple enough that one individual could direct a large number of individuals. Thus, hierarchies had a large branching ratio: each controller was in charge of a large number of individuals. As time progressed, the behavior of individuals diversified as did the collective tasks they performed. The increasing diversity of individual behaviors implies an increase in the complexity of the entire system viewed at the scale of the individual. Consequently, this required reducing the branching ratio by adding layers of management that served to exercise local control. As viewed by higher levels of management, each layer simplified the behavior to the point where an individual could control it. The hierarchy acts as a mechanism for communication of information to and from management. The role is also a filtering one, where the amount of information is reduced on the way up. Conversely, commands from the top are elaborated (made more complex) on the way down the hierarchy. As the collective behavioral complexity at the scale of an individual increases, the branching ratio of the control structure becomes smaller and smaller so that fewer individuals are directed by a single manager, and the number of layers of management increases. The formation of such branching structures allows an inherently more complex local behavior of the individuals, and a larger complexity of the collective behavior as well. The most dramatic increases in the complexity of organizational behavior followed the industrial revolution. The use of new energy sources and automation enabled larger scale behavior in and of itself. This, in turn, enabled higher complexity behaviors of human systems because the amplification of the behavior to a larger scale can be accomplished by the use of energy rather than by task repetition. At the point at which the collective complexity reaches the complexity of an individual, the process of complexity increase encounters the limitations of hierarchical structures. Hierarchical structures are not able to provide a higher complexity and must give way to structures that are dominated by lateral interactions. A hierarchy serves to create correlations in the behavior of individuals that are similar in many ways to the behavior of a network. The hierarchy serves as a kind of scaffolding. At the transition point, it becomes impossible to exercise control, so the management effectively becomes divorced from the functional aspects of the system. Lateral interactions that replace the control function have been present in hierarchical structures, however, they become necessary when the hierarchical control structure fails due to the high complexity of collective behavior. The greater the dependence of a system on the hierarchy, the more dramatic the changes that then take place. The lateral interactions achieve the correlations in behavior that were previously created by management. As such mechanisms are introduced, layers of management can be removed. Over the course of the transition, the hierarchy exercises control over progressively more limited aspects of the system behavior. Some of the behavior patterns that were established through the control hierarchy may continue to be effective; others cannot be since an increase in system complexity must come about through changes in behavior. Among these changes are the coordination mechanisms themselves, which must be modified. It could be argued that this picture describes much of the dynamics of modern corporations. Upper levels of management have turned to controlling fiscal rather than production aspects of the corporation. In recent years, corporate downsizing has often been primarily at the expense of the middle management, resulting in a reduction of payroll and little change in production. Hierarchical control has been replaced by decision teams introduced by corporate restructuring; and the reengineering of corporations has focused on the development of task related processes that do not depend on hierarchical control. Using this argument it is straightforward to understand why control structures ranging from communism to corporate hierarchies could not perform the control tasks required of them in recent times. As long as the activities of individuals were uniform and could be simply described, for example, soldiers marching in a row, or manufacturing workers producing a single product by a set of repetitive and simple activities (pasting eyes on a doll, screwing in bolts) control could be exercised. The individual's activities can be specified once for a long period of time, and the overall behavior of the collective could be simply described. The collective behavior was simple; it could be summarized using a description of a simple product and the rate of its production. In contrast, central control cannot function when activities of individuals produce many products whose description is complex; when production lines use a large number of steps to manufacture many different products; when the products vary rapidly in time; and the markets change rapidly because they themselves are formed of individuals with different and rapidly changing activities. It is useful to distinguish networks that coordinate human activity from markets that coordinate resource allocation. Markets are a distinct type of system that also results in an emergent collective behavior based upon the independent actions of many individuals. Markets such as the stock exchanges or commodity markets coordinate the allocation of resources (capital, labor and materials) according to the dynamically changing value of their use in different applications. Markets function through the actions of many agents (individuals, corporations and aggregate funds). Each agent acts according to a limited set of local objectives, while the collective behavior can coordinate the transfer of resources across many uses. Markets are distinct from networks in that they assume that the interactions among all agents in regard to a single resource can be summarized by a single time-dependent variable which is the value of the relevant resource. To illustrate the problem of central control of a complex economic system consider examples of the problem of resource allocation. An example might be the supply of oil to a country. For an individual to allocate the supply of oil, all of the needs of different users in amounts and times, the capabilities of different suppliers, and the transportation and storage available must be taken into account. Even if one were to suggest that a computer program might perform the allocation, which is recognized as a formally difficult computational problem, the input and output of data would often eliminate this possibility. One of the crucial features of such an allocation problem is that there are both small and large suppliers and small and large users. As the number of independent users and the variation in their requirements increases, the allocation problem becomes impossible to solve. At the same time, a market is effective in performing this allocation with remarkable efficiency. A more familiar example, which in many ways is more salient, is the problem of food supply to a metropolitan area. The supply of food is not a market, it is a network based upon a market structure. In a metropolitan area there are hundreds to thousands of small and large supermarkets, thousands to tens of thousands of restaurants, each with specific needs that in the optimal case would be specified by immediate requirements (on demand) rather than by typical or average need over time. The suppliers of foods are also many and varied in nature. Consider also the different categories of foods: produce, canned goods, baked goods, etc. The transportation and storage requirements of each are subject to different constraints. The many types of vehicles and modes of transportation represent another manifold of possibilities. The market-based system achieves the necessary coordination of food supply without apparent hitch and with necessary margins of error. To consider conceptually the dynamic dance of the supply of food to a city that enables daily availability is awe-inspiring. Even though there are large supermarket chains that themselves coordinate a large supply system, the overall supply system is much greater. Realizing that this coordination of effort relies upon the action of many individuals gives meaning to the concept of complex collective behavior. One can also understand why in a centrally controlled system, consistent and adequate food supply would be a problem. In order to have any hope of controlling such a supply problem it would have to be simplified to allow for only a few products in only a few stores. These were well-known characteristics of food supply in communist regimes. They were seen to reflect the general economic ineffectiveness of such forms of government. In this context the connection is quite direct. While considering the allocation problem in the context of food supply may illustrate the problems associated with central control, the same argument can be applied to various resource allocation and other coordination problems in large and small corporations. In conclusion, the implication of the disappearance or dramatic changes in centrally controlled human organizations is that the behaviors of collections of human beings do not simplify sufficiently to be controlled by individuals. Instead of progressive simplification from an individual to larger and larger collections of individuals, we have the opposite, an increasing complexity that is tied to an increasing complexity of the demands of the environment. This makes it impossible for an individual to effectively control collective behaviors. While specific individuals have been faulted for management errors that have led to corporate failures, the analysis performed here suggests that it is inevitable for management to make errors under these circumstances. Finally, from an academic point of view, for those interested in developing an understanding of the political, social or economic behavior of the human civilization or its various parts, there are several important consequences. The high collective complexity implies that as individuals we are unable to fully understand the collective behavior. This does not mean that insights and partial understandings are impossible. However, the existence of many different scales of behavior in a complex system implies that two traditional approaches to modeling or considering such systems cannot be effective. The first assumes that the collective behavior can be understood solely from large scale interactions; specifically, a description of the interactions between nations. The second assumes that the collective behavior can be understood by decomposing the system into its smallest elements and developing models based upon individual behavior. A complete specification of each of the physical components of a system would describe also the collective system behavior, however, such a complete specification is impossible. Mapping or simulating all individual behaviors is ineffective as an approach to gaining understanding. This reductionist view, dominating much of the scientific thought, does not take into consideration the significance of large scale correlations essential to the complex collective behaviors we would like to understand. Effective models must build descriptions that account both for the many scales of behavior of a system and the interplay between environmental and system properties. In addition, it is the dynamic behavior patterns of the system that must be the focus of the understanding. The interdependence of human civilization on a global scale is manifest in the many ways that local actions in one part of the world affect global behaviors. From military acts to humanitarian aid global response has taken the place of local interactions. Implicit in this discussion is recognizing that the interdependence affects individuals in various ways and at various scales. For example, the invasion of Kuwait by Iraq in 1990 had a manifest global response despite originally involving only a tiny proportion of the global population. The effects of the oil embargo and OPEC in the 1970s illustrated the global impact of the supply of oil from the Middle East and is reflected in the continued global concerns in that region. The impact on consumers, corporations and economies of the world of the production of automobiles and consumer electronics in Japan is well appreciated, as is the growing impact of the exports of other Pacific Rim nations. A disruption of the supply of products, even a partial disruption as occurred for example in the wake of the earthquake in Kobe, can have global impact. The potential impact that a small nation can cause through development of nuclear weapons has recently been manifest in the global response to events in North Korea. The widespread destruction that could result from use of nuclear weapons of the arsenals of the nuclear powers is well recognized. The drug production in specific parts of the world such as in Colombia, has relevance to individuals and the public in many other areas of the world. Various recent occurrences of social disruption and conflict in Somalia, Bosnia and Rwanda illustrate the global response to social disruption in what are considered relatively out of the way places of the world. Since World War II various local conflicts have attained global significance and attention, e.g. Korea, Vietnam, and the Middle East. Changes of government in diverse countries such as Iran in the 1970s and South Africa in the 1990s occurred in an environment of global influences and consequences. The example of South Africa is of particular interest since the global influence (the boycott) was directed at internal civil rights rather than external interactions. The global aid in response to famines in Africa, and earthquakes and floods in other parts of the world, are further indications of the global response to local events. The impact of fluctuations of the value of currencies during the 1990s in Italy and England, Mexico, and recently the United States have illustrated the power of global currency markets. These examples illustrate how, at the present time, events on a national scale can have global effects. However, smaller-scale events can also have global effects. One of the manifestations of the global interdependence is the wide geographic distribution of product manufacturing and utilization. Manufacturing a product involves raw materials, capital, design, assembly and marketing. Today each may originate or occur in a different part of the world, or even in several. The loss of a factory in any one of tens of countries may significantly affect the production of a corporation. Since individual corporations can be primary suppliers of particular products, this can in turn affect the lives of individuals throughout the world. In order to consider the effects of the world on a particular individual one must specialize. Consider, for example, the influx of students from around the world into universities in the greater Boston area and analyze how this affects faculty, students, and the Boston area economy, as well as how the existence of Boston affects them. Even more specifically, ask how a student from one part of the world can affect another student from another part of the world when both meet in Boston. Or, how an individual faculty member affects students that come from many parts of the world, and how students coming from many parts of the world affect a faculty member. Even to ask these questions demonstrates the interdependence at the individual level that now exists throughout the globe. Moreover, this description of interdependence has not yet accounted in detail for the effects of direct information exchange through the telephone, global mass media, international journals and conferences, and recently the Internet. The interdependence of global human civilization is self-consistently related to the increasing complexity both of our individual social environments and of the behavior of human civilization in entirety. It is also possible to make a connection to internal structural changes that are taking place in social and economic systems. Complex systems that display complex collective behavior are structured as networks. By contrast, the traditional human social structure, whether in government or in industry, has been based upon control hierarchies. Just as a single neuron is not able to dictate the behavior of a neural system, an emergent complex network of human beings may not be directed by a single human being. In this context, the traditional conflict between individual and collective good and rights should be revisited. This philosophical and practical conflict manifested itself in the conflict between democracy and communism. It was assumed that communism represented an ideology of the collective while democracy represented an ideology of the individual. The transition to a complex organism implies that this conflict has been resolved, not in favor of one or the other, but rather in favor of a third category, an interdependent complex collective formed out of diverse individuals. The traditional collective model was a model that relied upon uniformity of the individuals rather than diversity. Similarly, the ideology of the individual did not view the individual in relation to the collective, but rather the individual serving himself or herself. It should be acknowledged that both philosophies were deeper than their caricatures would suggest. The philosophy of democracy included the idea that the individualistic actions would also serve the benefit of the collective, and the philosophy of communism included the idea that the collective would benefit the individual. Nevertheless, the concept of civilization as a complex organism formed out of human beings is qualitatively different than either form of government. There are two natural conclusions to be drawn from recognizing that human beings are part of a global organism. First, one can recognize that human civilization has a remarkable capacity for responding to external and internal challenges. The existence of such a capacity for response does not mean that human civilization will survive external challenges any more than the complexity of any organism guarantees its survival. However, one can hope that the recent reduction in the incidence of military conflicts will continue and the ability to prevent or address local disasters will increase. The difficulties in overcoming other systematic ills of society, such as poverty, may also be challenged successfully as the origins of these problems become better understood. Second, the complexity of our individual lives must be understood in the context of a system that must enable its components (us) to contribute effectively to the collective system. Thus, we are being, and will continue to be shielded from the true complexity of society. In part this is achieved by progressive specialization that enables individuals to encounter only a very limited subset of the possible professional and social environments. This specialization will have dramatic consequences for our children, and their educational and social environments are likely to become increasingly specialized as well. What additional conclusions can be made from the recognition of human civilization as a complex organism? Given the complexity of its behavior, it is necessary to conclude self-consistently that as individuals we are unable to understand it, even though we comprise it as a collective. Therefore, one would be unwise to argue, on the basis of general considerations, matters of social policy. Social policy questions must be dealt with by the system, by the people involved, as direct challenges to the system. However, this analysis suggests that it is possible to understand the functional structure and dependencies that exist in global civilization and organizations that comprise it. These dependencies are related to the scale of behaviors that can be triggered in response to internal and external challenges. When analyzing the nature of challenges, a similar analysis can be performed to recognize the scale, or scales, of behavior that are necessary to respond to them effectively. Recognizing the scale of necessary response should be an important contribution to our ability to address both internal and external challenges. This is a brief introduction to concepts and tools of complex systems that can be applied to a wide range of systems. The central notion was the development of an understanding of the complexity profile which quantifies the relationship between independence, interdependence and the scale of collective behavior. By developing such tools we may discover much about ourselves, individually and collectively. The merging of disciplines in the field of complex systems runs counter to the increasing specialization in science and engineering. It provides many opportunities for synergies and the recognition of general principles that can form a basis for education and understanding in all fields. Random, coherent and correlated behaviors illustrate the relationship between the behavior of parts and the collective behavior of a system. In both random and coherent behavior the collective behavior of the system is simple. Correlated behavior gives rise to complex collective behavior. Examples illustrating these types of behavior can be found in physical, biological and social systems. The complexity profile is a mathematical tool that is designed to capture important aspects of the relationship between the behavior of parts of a system and the behavior of the entire system. Behaviors of the system are assigned a scale which is related to the ability of an observer to see that behavior. Typically, larger scale behaviors involve coordination between more parts and/or larger amounts of energy. The complexity profile counts the number of behaviors that are observable at a particular scale, which includes all behaviors assigned to that scale or larger scales. When a system is formed out of independent parts, the behaviors are on a small scale. When a system is formed out of parts that all move in the same direction, the behavior is on the largest scale. When a system is formed out of parts whose behaviors are partially correlated and partially independent then as we look at the system on finer and finer scales we see more and more details. This is characteristic of complex systems formed out of specialized and correlated parts. Such systems have a complexity profile that declines gradually with scale. The complexity profile of a human being is a smoothly falling curve because there are various scales at which details of the internal behavior of parts of a human being become visible. For example, at the atomic scale the motion of individual atoms is visible, but most of these motions are not visible at the cellular scale. When considering the collective behavior of groups of human beings, it is convenient to consider as a reference the value of the complexity profile at the scale of a human being, C Individual . This describes the complexity of influence one human being can have on another. Hierarchical organizations are designed to impose correlations in human behavior primarily through the influence of the hierarchical control structure. In an ideal hierarchy all influences/communications between two "workers" must travel through a common manager. As the complexity of collective behavior increases, the number of independent influences increases, and a manager becomes unable to process/communicate all of them. Increasing the number of managers and decreasing the branching ratio (the number of individuals supervised by one manager) helps. However, this strategy is defeated when the complexity of collective behavior increases beyond the complexity of an individual. Networks allowing more direct lateral interactions do not suffer from this limitation. The behavior of a system and the environmental demands upon it are related. This relationship is established through the selection of systems that continue to survive in the environment. In particular, the complexity of the environmental demands must be less than the complexity of the system behavior for organisms that are likely to survive. The environment of human organizations is partially composed of other human organizations. Through competition an increase in the complexity of one organization leads to an increase in the complexity of the environment of other organizations. This suggests that over time the complexity of organizations increase until the collective behavior becomes more complex than the behavior of an individual human being. The history of human civilization reflects a progressive increase in the complexity of large scale behaviors. Early civilizations introduced a few relatively simple large scale behaviors by use of many individuals (slaves or soldiers) performing the same repetitive task. Progressive specialization with coordination increased the complexity of large scale behaviors. The industrial revolution accelerated this process which continues till today. When the complexity of collective behaviors increases beyond that of an individual human being then hierarchical controls become ineffective. Hierarchically controled systems must yield to networked systems. Note that a system which has fixed energy and material can change its complexity profile only by transfering activities from one scale to another. Increasing complexity at one scale must be compensated by decreasing complexity at another scale. However, an increasing human population, and the addition of sources of energy during the industrial revolution (coal, oil and gas), violated these conditions, enabling the complexity to increase on all scales. As indicated on the horizontal axis, the scale of human civilization also increased. A schematic history of human civilization reflects a growing complexity of the collective behavior of human organizations. 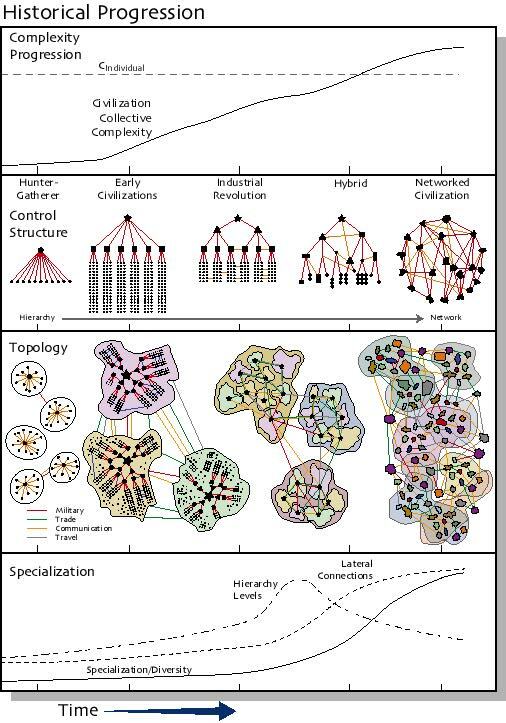 The internal structure of organizations changed from the large branching ratio hierarchies of ancient civilizations, through decreasing branching ratios of massive hierarchical bureaucracies, to hybrid systems where lateral connections appear to be more important than the hierarchy. As the importance of lateral interactions increases, the boundaries between subsystems become porous. The increasing collective complexity also is manifest in the increaseing specialization and diversity of professions. Among the possible future organizational structures are fully networked systems where hierarchical structures are unimportant.